Collaborating artists and husband and wife, ROBIN and JOHN GUMAELIUS incorporate ceramic, steel and wood to create animated human and birdlike sculptures. Their works are comical, bizarre and highly inventive. Robin says, “Radio stories, history books, biking adventures, gardening notes, neighbors spied, strangers watched in stores and parks and cars jangle together in our heads and come so freely to our fingers that when we see the pieces finished we are often delighted – as if we are not their creators; they just come to talk with us for a while and then leave again”. 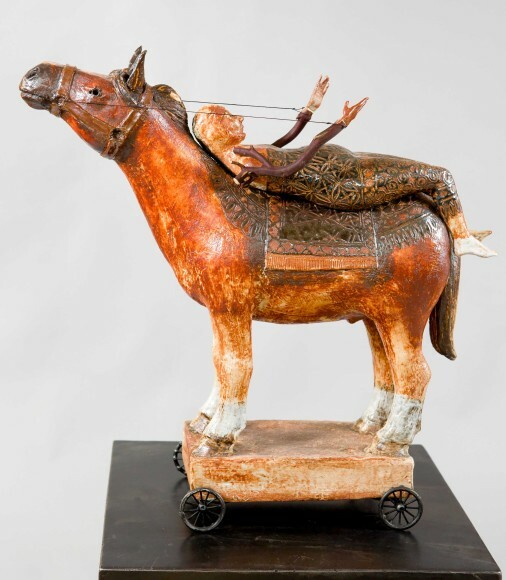 In their unique working relationship, Robin and John combine both skill and imagination together as an artistic team to build a singularly unusual world out of clay and mixed media. near the coast in Washington. While starting with a treehouse, they have also built their own home, studio, barn and lush garden. VINCE CARL has shifted from his focus on the figure to abstraction with great success after several years of hard work as his process evolved technically and philosophically.